There are two components in the Northern European demand for explicit changes to the 2,000-year-old discipline of the Church based on the immutable words of the Word Himself. One is, as it has become clear to many recently, that many of these prelates simply do not believe in anything anymore. The second is harder to assess, and it is in many senses incomprehensible to those who come from cultures in which Catholicism was never removed from the national character by way of the violent transformation of the Protestant Revolt. Re-foundation is at the very core of Protestantism, and it explains Puritanism (as well as its opposite, extreme Protestant Liberalism), and it often happens that Catholics from historically Protestant-majority lands internalize the need for explicit change of rules as if a change of text could magically transform men, society, and nature -- if only the Church wrote that it accepted that wrong is right, and wrong would be right, especially when all are acting wrongly! Isn't anything else "hypocrisy"? Converts to Catholicism from Protestantism can often also see right through this fallacy: yes, the Church demands nothing less than her own standards of perfection, and she cannot change them, because her Master gave them to her. But that does not mean that she asks for impossible things. She asks for a sincere pursuit of holiness: Mary Magdalen became one of the greatest saints, but first she chose penance and changed her life. Likewise, the Confessional is available for all who wish to change their lives. 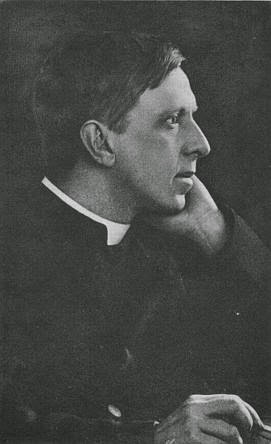 For our first post celebrating the centenary of the death of just such a convert, Monsignor Robert Hugh Benson (October 19, 1914), some reflections from his Paradoxes of Catholicism (conferences and sermons preached mostly in New York in 1912 and in Rome in 1913, and published not long before his death). They are reflections on the true nature of the Church's unchangeable moral demands. A simple explanation that would have avoided much of the needless discussion in the ongoing Synod assembly. Holy, Holy, Holy! -- IS. vi. 3. Christ Jesus came into this world to save sinners. I TIM. I. 15. A VERY different pair of charges -- and far more vital -- than those more or less economic accusations of worldliness and otherworldliness ... concern the standards of goodness preached by the Church and her own alleged incapacity to live up to them. These may be briefly summed up by saying that one-half the world considers the Church too holy for human life, and the other half, not holy enough. We may name these critics, respectively, the Pagan and the Puritan. I. It is the Pagan who charges her with excessive Holiness. "You Catholics," he tells us, "are far too hard on sin and not nearly indulgent enough towards poor human nature. Let me take as an instance the sins of the flesh. Now here is a set of desires implanted by God or Nature (as you choose to name the Power behind life) for wise and indeed essential purposes. These desires are probably the very fiercest known to man and certainly the most alluring; and human nature is, as we know, an extraordinarily inconsistent and vacillating thing. Now I am aware that the abuse of these passions leads to disaster and that Nature has her inexorable laws and penalties; but you Catholics add a new horror to life by an absurd and irrational insistence on the offence that this abuse causes before God. For not only do you fiercely denounce the "acts of sin," as you name them, but you presume to go deeper still to the very desire itself, as it would seem. You are unpractical and cruel enough to say that the very thought of sin deliberately entertained can cut off the soul that indulges in it from the favour of God. "Or, to go further, consider the impossible ideals which you hold up with regard to matrimony. These ideals have a certain beauty of their own to persons who can embrace them; they may perhaps be, to use a Catholic phrase, Counsels of Perfection; but it is merely ludicrous to insist upon them as rules of conduct for all mankind. Human Nature is human nature. You cannot bind the many by the dreams of the few. "Or, to take a wider view altogether, consider the general standards you hold up to us in the lives of your saints. These saints appear to the ordinary commonplace man as simply not admirable at all. It does not seem to us admirable that St. Aloysius should scarcely lift his eyes from the ground, or that St. Teresa should shut herself up in a cell, or that St. Francis should scourge himself with briers for fear of committing sin. That kind of attitude is too fantastically fastidious altogether. You Catholics seem to aim at a standard that is simply not desirable; both your ends and your methods are equally inhuman and equally unsuitable for the world we have to live in. True religion is surely something far more sensible than this; true religion should not strain and strive after the impossible, should not seek to improve human nature by a process of mutilation. You have excellent aims in some respects and excellent methods in others, but in supreme demands you go beyond the mark altogether. We Pagans neither agree with your morality nor admire those whom you claim as your successes. If you were less holy and more natural, less idealistic and more practical, you would be of a greater service to the world which you desire to help. Religion should be a sturdy, virile growth; not the delicate hothouse blossom which you make it." The second charge comes from the Puritan. "Catholicism is not holy enough to be the Church of Jesus Christ; for see how terribly easy she is to those who outrage and crucify Him afresh! Perhaps it may not be true after all, as we used to think, that the Catholic priest actually gives leave to his penitents to commit sin; but the extraordinary ease with which absolution is given comes very nearly to the same thing. So far from this Church having elevated the human race, she has actually lowered its standards by her attitude towards those of her children who disobey God's Laws. "And consider what some of these children of hers have been! Are there any criminals in history so monumental as Catholic criminals? Have any men ever fallen so low as, let us say, the Borgia family of the Middie Ages, as Gilles de Rais and a score of others, as men and women who were perhaps in their faith `good Catholics' enough, yet in their lives a mere disgrace to humanity? Look at the Latin countries with their passionate records of crime, at the sexual immorality of France or Spain; the turbulence and thriftlessness of Ireland, the ignorant brutality of Catholic England. Are there any other denominations of Christendom that exhibit such deplorable specimens as the runaway nuns, the apostate priests, the vicious Popes of Catholicism? How is it that tales are told of the iniquities of Catholicism such as are told of no other of the sects of Christendom? Allow for all the exaggeration you like, all the prejudice of historians, all the spitefulness of enemies, yet there surely remains sufficient Catholic criminality to show that at the best the Church is no better than any other religious body, and at the worst, infinitely worse. The Catholic Church, then, is not holy enough to be the Church of Jesus Christ." II. When we turn to the Gospels we find that these two charges are, as a matter of fact, precisely among those which were brought against our Divine Lord. First, undoubtedly, He was hated for His Holiness. Who can doubt that the terrific standard of morality which He preached -- the Catholic preaching of which also is one of the charges of the Pagan -- was a principal cause of His rejection. For it was He, after all, who first proclaimed that the laws of God bind not only action but thought; it was He who first pronounced that man to be a murderer and an adulterer who in his heart willed these sins; it was He who summed up the standard of Christianity as a standard of perfection, Be you perfect, as your Father in Heaven is perfect; who bade men aspire to be as good as God! It was His Holiness, then, that first drew on Him the hostility of the world -- that radiant white-hot sanctity in which His Sacred Humanity went clothed. Which of you convinceth me of sin? . . . Let him that is without sin amongst you cast the first stone at her! These were words that pierced the smooth formalism of the Scribe and the Pharisee and awoke an undying hatred. It was this, surely, that led up irresistibly to the final rejection of Him at the bar of Pilate and the choice of Barabbas in His place. "Not this man! not this piece of stainless Perfection! Not this Sanctity that reveals all hearts, but Barabbas, that comfortable sinner so like ourselves! This robber in whose company we feel at ease! This murderer whose life, at any rate, is in no reproachful contrast to our own!" Jesus Christ was found too holy for the world. But He was found, too, not holy enough. And it is this explicit charge that is brought against Him again and again. It was dreadful to those keepers of the Law that this Preacher of Righteousness should sit with publicans and sinners; that this Prophet should allow such a woman as Magdalen to touch Him. If this man were indeed a Prophet, He could not bear the contact of sinners; if He were indeed zealous for God's Kingdom, He could not suffer the presence of so many who were its enemies. Yet He sits there at Zacchaeus' table, silent and smiling, instead of crying on the roof to fall in; He calls Matthew from the tax-office instead of blasting him and it together; He handles the leper whom God's own Law pronounces unclean. III. These, then, are the charges brought against the disciples of Christ, as against the Master, and it is undeniable that there is truth in them both. It is true that the Catholic Church preaches a morality that is utterly beyond the reach of human nature left to itself; that her standards are standards of perfection, and that she prefers even the lowest rung of the supernatural ladder to the highest rung of the natural. And it is also true, without doubt, that the fallen or the unfaithful Catholic is an infinitely more degraded member of humanity than the fallen Pagan or Protestant; that the monumental criminals of history are Catholic criminals, and that the monsters of the world -- Henry VIII for example, sacrilegious, murderer, and adulterer; Martin Luther, whose printed table-talk is unfit for any respectable house; Queen Elizabeth, perjurer, tyrant, and unchaste -- were persons who had had all that the Catholic Church could give them: the standards of her teaching, the guidance of her discipline, and the grace of her sacraments. What, then, is the reconciliation of this Paradox? (i) First the Catholic Church is Divine. She dwells, that is to say, in heavenly places; she looks always upon the Face of God; she holds enshrined in her heart the Sacred Humanity of Jesus Christ and the stainless perfection of that Immaculate Mother from whom that Humanity was drawn. How is it conceivable, then, that she should be content with any standard short of perfection? If she were a Society evolved from below -- a merely human Society that is to say -- she could never advance beyond those standards to which in the past her noblest children have climbed. But since there dwells in her the Supernatural - - since Mary was endowed from on high with a gift to which no human being could ascend, since the Sun of Justice Himself came down from the heavens to lead a human life under human terms -- how can she ever again be content with anything short of that height from which these came? (2) But she is also human, dwelling herself in the midst of humanity, placed here in the world for the express object of gathering into herself and of sanctifying by her graces that very world which has fallen from God. These outcasts and these sinners are the very material on which she has to work; these waste products of human life, these marred types and specimens of humanity have no hope at all except in her. For, first, she desires if she can -- and she has often been able -actually to raise these, first to sanctity and then to her own altars; it is for her and her only to raise the poor from the dunghill and to set them with the princes. She sets before the Magdalen and the thief, then, nothing less but her own standard of perfection. Yet though in one sense she is satisfied with nothing lower than this, in another sense she is satisfied with almost infinitely nothing. If she can but bring the sinner within the very edge of grace; if she can but draw from the dying murderer one cry of contrition; if she can but turn his eyes with one look of love to the crucifix, her labours are a thousand times repaid; for, if she has not brought him to the head of sanctity, she has at least brought him to its foot and set him there beneath that ladder of the supernatural which reaches from hell to heaven. For she alone has this power. She alone is so utterly confident in the presence of the sinner because she alone has the secret of his cure. There in her confessional is the Blood of Christ that can make his soul clean again, and in her Tabernacle the Body of Christ that will be his food of eternal life. She alone dares be his friend because she alone can be his Saviour. If, then, her saints are one sign of her identity, no less are her sinners another. For not only is she the Majesty of God dwelling on earth, she is also His Love; and therefore its limitations, and they only, are hers. That Sun of mercy that shines and that Rain of charity that streams, on just and unjust alike, are the very Sun and Rain that give her life. If I go up to Heaven she is there, enthroned in Christ, on the Right Hand of God; if I go down to Hell she is there also, drawing back souls from the brink from which she alone can rescue them. For she is that very ladder which Jacob saw so long ago, that staircase planted here in the blood and the slime of earth, rising there into the stainless Light of the Lamb. Holiness and unholiness are both alike hers and she is ashamed of neither -- the holiness of her own Divinity which is Christ's and the unholiness of those outcast members of her Humanity to whom she ministers. By her power, then, which again is Christ's, the Magdalen becomes the Penitent; the thief the first of the redeemed; and Peter, the yielding sand of humanity, the Rock on which Herself is built.